The Red Sea has some of the best diving in the world, including The Brothers whose dives are detailed here. To dive at the Brothers, and other Egyptian marine parks, you need to have: logged at least 50 dives, have valid insurance, have a surface marker buoy and a torch. You might also be interested in liveaboards visiting the Brothers. More photos of diving around the Brothers are in the our Photo Gallery. Big Brother. Photo credit: Tim Nicholson. The Brothers, or El Akhawein, are two small islands in the middle (width-ways) of the Red Sea. Big Brother and Little Brother are a 5 minute boat ride apart. The larger Brother is home to a lighthouse manned by the military. Often surrounded by wild currents, the scenary makes for some wonderful dives. Add to this the high likelihood of seeing sharks, and you're guaranteed fantastic experiences. We prefer the Little Brother for sheer decorativeness, but it's a narrow decision. The Brothers are steep-sided cones. They were probably formed by volcanic action caused by the spreading of the Red Sea rift. The Egyptian authorities have acted to protect the Brothers: the islands are periodically closed to divers, and even when open a $5 (US) fee per diver per day is charged (the money going towards protecting the marine environment). At the moment diving is allowed so go whilst you've got the opportunity. Book a place on a liveaboard, generally out of Hurgahda. You can make your way independently to Hurghada and join the boat there, or book a complete package from your own country. For suggestions of companies operating dive boats and complete packages, see the Dive Operators page. The trip from Hurghada to the Brothers takes around 8 hours. You need good weather to dive the Brothers. It's an exposed spot with no shelter for boats to moor up in. Anchoring is forbidden so mooring is at permanently fixed buoys. In very bad weather these may be swept away. The winds are often weakest during full moon, and if you can stand the heat, the months of June, July and August are the calmest. Sharks increase in number from May. The Aida II is an Italian ship which was carrying troops one night in 1957 when it hit Big Brother. A large wreck with much intact superstructure, its shallowest point is at 15 m. Located on the Western tip of the island, the current is often strong. It may even diverge over the wreck. So you could hang easily over the mast, but a few metres either side would be battling to stay in one place. Watch the fish over the wreck and make for the ones that aren't moving very quicky. A very good dive indeed with huge shoals of fish generally present, and large pelagics swooping in with the current. It slopes down the reef, descending to over 45 metres. There is more wreckage not far north from the Aida. Part of it looks like train carriages, accompanied by large wheels. A wall of soft corals drops to 40m, where you hit a short plateau. Over the edge of the plateau another wall descends even further. An excellent dive where you might see hammerhead or white tip reef sharks, schools of jacks, big grouper and scores of other fish. Which direction you take along the wall depends on the current. It can be a lovely drift dive. A Victorian lighthouse stands in the middle of the south-west side of the Island, and you'll know when you're under the jetty projecting from the lighthouse from the old cans and other debris present. Choose your maximum depth: just about any is possible here so you can do as shallow or deep a dive as you wish. A very similar dive to the south wall. "Unspoilt wall dives, swathed in soft coral, hammerheads and mantas, shoals of snapper and jack - big current, big experience. " "Never the same twice and always a good chance of all sorts of sharks." "My first encounter with a school of hammerheads on a scooter dive. Great diving and awesome scenery. " "Two semi deep wrecks, strong currents make for challenging diving rewarded by untouched coral that flies by after hanging in the current shadow for hammerhead sharks and more." Little Brother's reef stretches out to the North East of the island and bottoms out to a sandy bottom at around 47 m. A beautiful dive with an excess of black coral, soft corals and sea fans. The top of the reef is between 2 and 6m from the surface and so there's plenty to see at the end of the dive. "The smaller of the two brothers packs a punch - what it lacks in size certainly is made up for in it's fatastic wall scenery. the plethora of soft coral, of all shapes and sizes. I seem to have more luck on the south western edge of this island in encountering sharks too. Fantastic experience if you catch a calm period! " "Beautiful soft coral all over the site and Big change of multiple Grey Reef Sharks and sometimes Scalloped Hammerhead Shark. " Some useful books to take with you on your trip to the Brothers. 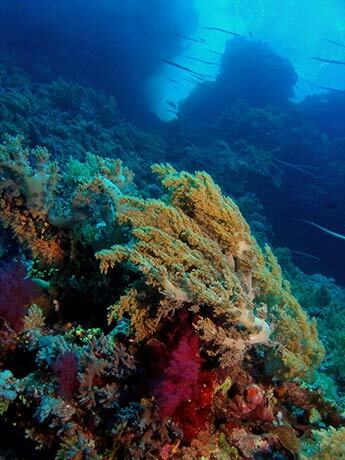 Coral Reef Guide Red Sea covers all common species of underwater life of the Red Sea and the Gulf of Aden that you are likely to see while diving or snorkelling. Each species is illustrated with a full-colour photograph and the text gives details of range and characteristic behaviour. A map of good dive sites appears on the inside front cover. Includes jellyfish, corals, nudibranchs, starfish, sea urchins, fishes and turtles. Please tells us about your experiences of diving the Red Sea. Was the diving good? What about the dive operator or the boat? Let us know. For any other questions or comments fill in the form below.